(1dec01) This issue will present thoughts about powering boats per the Coast Guard. Next issue, 15dec01, talk about my personal messin' with motors in 2001. John Bell's kids peer out the slot top of his AF4's cabin. If you were building an outboard powerboat you might ask yourself "How much power can I safely place on my boat?" It's a good question. The Coast Guard wrote up a pamplet that addresses that question plus other important ones about safety in homebuilt power boats. I've never seen the pamplet in the flesh and have heard that it is not easy to come by. You can download it at the website The Duck Hunter's Boat Page (or try HERE). There it comes over as an MS Word file that you save and look at offline. My version of MS Word must not mesh with theirs because I also got a lot of trash and no figures (most likely what I see as trash is the figures in an up to date version). But it is written to be understood without figures. It is not clear to me what sort of force is behind the pamplet. I see boats powered well beyond its recommendations all the time. The placard you see on commercial powerboats pretty well agrees with the limits given in the pamplet. The pamplet gives the reasoning behind some of the limits, always a dangerous thing to do because sometimes the logic leaves you wondering. I think the limits given in the pamplet are based on experience and are pretty reasonable. The pamplet says specifically that there are none! This is one area where I fail to follow the logic. This you can figure for your boat. The factors involved are length, transom width, transom height, steering method (remote or tiller), and chine type. Weight doesn't figure into it although it is the main speed factor in a planing powerboat. Then you measure the transom width in feet (I think they intend the width at the planing surface). Lets say you measure 5'2" which you would convert to 5.17'. Next you multiply the length times the transom with to get the FACTOR. In this case it would be 17.58 x 5.17 = 90.88. Then you round off that to the nearest whole number, in this case the factor is 91. The Coast Guard comes down pretty hard on flat bottomed hard chined boats as you see. To quote the pamplet, "Why? Because with a hard chine and a flat bottom you must turn more slowly to maintain stability." OK, I'll buy that while at the same time pointing out that the same flat bottomed hard chined boats with inboard power would have no limit to power by the same pamplet. Next I'll try to conjure up the chart for boats with factors above 52. Here we have three selections. The red solid line is "FOR OUTBOARDS WITH REMOTE STEERING AND A TRANSOM HEIGHT OF AT LEAST 20 INCHES". I've limited the factor to 200 which would be a pretty large boat, 25' x 8' for example. But in the pamplet there is no limit to the factor so to power an even larger boat you could extend the straight line as far as needed with the same slope. The green dashed line is "FOR OUTBOARDS THAT DO NOT HAVE REMOTE STEERING OR TRANSOM HEIGHT IS LESS THAN 20 INCHES". The black dotted line is "FOR FLAT-BOTTOMED, HARD-CHINED OUTBOARDS THAT DO NOT HAVE REMOTE STEERNG OR TRANSOM HEIGHT IS LESS THAN 20 INCHES". OK, the obvious question is what about flat bottomed boats with remote steering and 20" transoms? I'm pretty sure the writers didn't mean to place them in the high powered catagory. 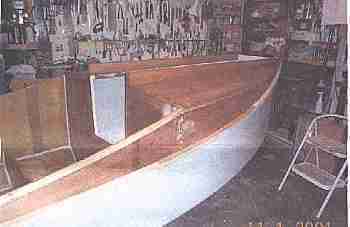 For example my stock AF4 has a 15" transom with 18' length and 4.5' transom width for a factor of 81. By the third line it would have a max safe hp of 25, and having used AF4 I would agree with that. 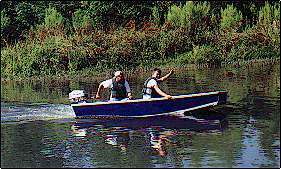 Here is mine planing at about 12 mph with a 10 hp motor at about 3/4 throttle. But if I raise the transom to 20" with a long shaft motor and add remote steering do I now jump to the red line and go to 72 hp?? If the problem with the flattie is handling in turns I don't see how the deeper transom or the remote steering makes it safer for triple the power. (No doubt it would be safer though). But a literal reading of the pamplet makes it appear that way. 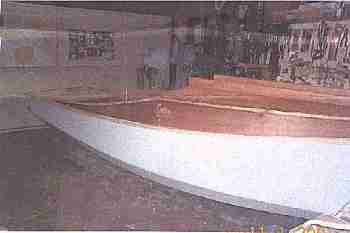 My Jonsboat design with 16' length and 4' width has a factor of 64 and would be limited to 17 hp. This one by Greg Rinaca has a long shaft 18 and goes about 25 mph as I recall. And If the purpose of the long shaft motor with its deeper transom is to keep water out of the stern, what about a short shaft motor sitting in a water tight draining well, as with AF4? Well, the pamplet can't address every case. So as always, use some judgement. I'll present my own messin' with motors in 2001. 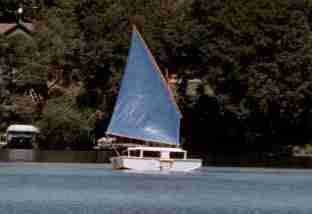 Sow's Ear is somewhere between a shantyboat like my Shanteuse and a cuddy power skiff like AF4. It has a lot more room in the cabin than does AF4 but a lot less than Shanteuse. And it has an open cockpit that will seat two or three adults in comfort unlike Shanteuse. Sow's Ear should be a bit more seaworthy than Shanteuse but keep in mind that no light and small flat bottomed boat is going to be seaworthy to any real degree. And it looks a bit more like a boat than does Shanteuse. As for looks, it follows closely on the heels of Bolger's Micro where the looks are the result of high volume and ease of building. Sow's ear will be a lot easier to build than Micro because powerboats have a lot fewer parts than do sailboats (assuming you are not going to build your own motor). And using a powerboat is a lot easier than using a sailboat, assuming you have a motor that is reliable. I think the irony of most modern sailboats is that no one will use one without a reliable motor, so they are really motor sailers. There is no question that a good motor makes the whole sailing operation in boats too large to manhandle a lot easier while you still have the option of smooth and quiet sailing. The cost involved is that the sail rig of any boat usually doubles the labor and materials needed and the setup time at the waterfront of the trailer sailer is often an hour instead of five minutes. So you see the advantages of a straight powerboat. I tried hard to make this one very easy to use, especially for a typical family. It will float in about 3" of water so launching and beaching is a breeze. The bow has a step through transom and you will need to step up 20" to get aboard and into the cabin, easy enough for a child or anyone with both hands full of gear. The main cabin room is 6.5' long and 6' wide and will sleep two adults. Atop the cabin is a slot top full length which you can cover with simple fabric. Behind that room is a storage/utiltiy area where you can store al of your gear and clothes, cook and keep a portable toilet. Aft of that is the cockpit, 5' long and 6' wide, large enough for lounging in a beach chair or keeping a short stack of those plastic lawn chairs. The sides are deep and secure for children. And in the stern is a full width self draining motor well. 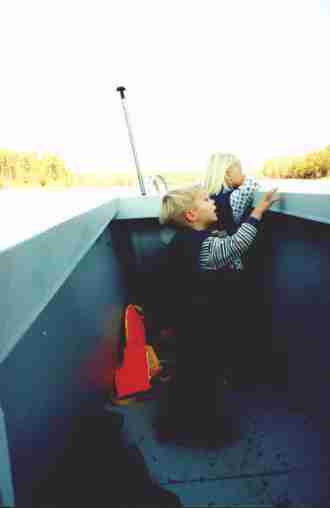 To steer the boat you will need to stand or sit on a tall chair to see over the cabin. Remote motor controls will be best but a long tiller extension to the motor will work well too. That is what I use with my AF4. The Coast Guard would advise no more than 25 hp on Sow's Ear, based on length, width, and the fact that it has a hard chine. It would take that much power to plane the boat at 2/3 throttle with some adults aboard, weight being all important. But this boat won't do well in big open waters that can get rough. 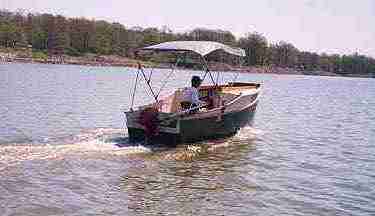 It will do very well with say 5 hp in protected smaller waters where planing and distance covered are not important. Construction is simple nail and glue. Sow's Ear needs seven sheets of 1/4" plywood and four sheets of 1/2" plywood. That is more than the longer AF4 but this boat has a lot more interior volume. Sow's Ear plans are $25 until one is built and tested. 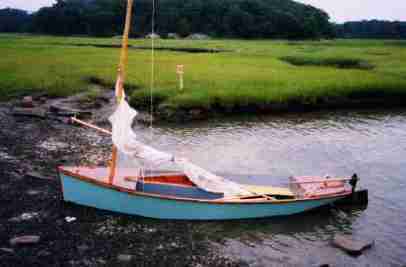 HC Skiff: One of these has been completed and sailed in Massachusetts. Here is one of the first photos - very pretty boat, I think. The builder has gotten many great comments from other boaters and it occurred to me that this boat was called the "Oystering Skiff, Cape Cod, taken off at Orleans (Massachusetts), Aug 7, 1933" in Howard Chapelle's great book American Small Sailing Craft, where I got the lines. So this is sort of a retro photo with classic boat in its classic Massachusetts setting. Electron: The California Electron is coming along. 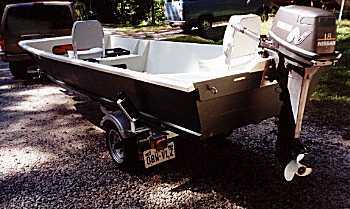 Right now a four cycle 2 hp outboard has been purchased so the original electric idea may wait a while. Mayfly: The prototype of the original 14' Mayfly is finished in New York state. 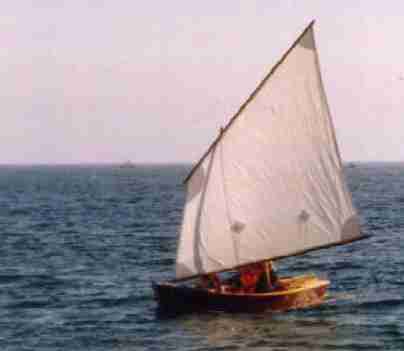 Here it is on its first sail (Long Island Sound). A Jewelbox Jr has been completed (with a lug rig) in Idaho. Waiting for good photo and some more testing but so far so good says the builder.